Kniphofia, also sometimes called tritoma, red hot poker, torch lily or poker plant, is a genus of plants in the family Xanthorrhoeaceae, that includes 70 or more species native to Africa. Some species have been commercially used horticulturally and are commonly known for their bright, rocket-shaped flowers. These plants produce spikes of upright, brightly-colored, red-to-orange flowers. This gives names such as "torch" and "red hot poker" to many of them. The flowers produce copious nectar while blooming and may attract many insect species. The Kniphofia genus is named after Johann Hieronymus Kniphof, an 18th century German physician and botanist. 'Brimstone' is sulphur yellow and will flower from October until Christmas, if the weather is not too cold. It is probably one of the most dependable growing varieties. Right through autumn and until the weather really turns, the glowing flowers of this superb perennial will light up the garden, combining with autumn tree and shrub foliage splendidly. Kniphofias are one of those invaluable plants that provide a last hurrah for herbaceous perennials, before winter arrives. Kniphofias are not difficult once you know that, at home in South Africa, they get plenty of rain as they are growing. Not too dry in summer and as dry as you can arrange in winter - good drainage is fairly essential. It grows in soils ranging from a pH of 6 (acidic ranges from 5.6 to 6) to 7.8 (slightly alkaline ranges from 7.6 to 8). It is adapted to loam, sand, clay loam, loamy sand, sandy clay loam and sandy loam soils, and prefers high fertility. 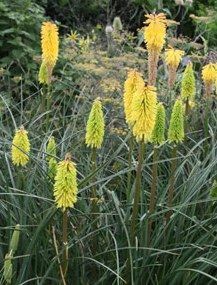 Uses: Kniphofia can be used in herbaceous borders devoted to hot colours. Here they can look particularly effective when used with other vibrant plants such as the salvias, crocosmia and late flowering helianthus etc. The cooler yellow flowered varieties can more easily combine with more general mixed planting in the border.